Seed corn is usually more affected than field corn. Stewart’s wilt is caused by the bacterium Pantoea stewartii, which is transmitted from plant to plant by the corn flea beetle. Many field corn hybrids have adequate levels of tolerance against the bacterium, so its effects on yields in these hybrids are not usually economically injurious. Seed corn inbreds and sweet corn, however, can be quite susceptible to the disease, and it can be an issue for both the yield of sweet corn and quality of seed corn. In some years, Stewart’s wilt can have serious effects on mature corn plants. Xiaoyang Zhu, a biologist with Agriculture and Agri-Food Canada (AAFC) in Ottawa, performs yearly cornfield disease surveys with other biologists from AAFC and the Ontario Ministry of Agriculture, Food, and Rural Affairs (OMAFRA). According to Zhu, Stewart’s wilt occurs mainly in southwestern Ontario and occasionally in eastern Ontario, and has not been found in Quebec since 2000. The disease’s distribution is mainly related to its mode of transmission via the corn flea beetle. Thus, the disease can be tracked by understanding the beetle’s population dynamics. Corn plants can be infected early as seedlings or later as mature plants, depending on when they are exposed to the bacterium by the corn flea beetle. Other grassy plants and insect species may harbour the bacterium as symptomless reservoirs, but little is known about the extent of their involvement in the disease process. The ability of the corn flea beetle to overwinter affects the risk of early infection. “The Stewart’s wilt bacterium overwinters in the gut of the corn flea beetle,” says Tracey Baute, field crops entomologist with OMAFRA. “The beetle can then transmit it to the young crop when the crop is just emerging.” Transmission occurs when the beetle takes a bite of the plant and then regurgitates or defecates into the wound. Early infection takes place in spring and often kills the young corn plants. Baute explains that the disease is less prevalent in eastern Ontario and Quebec than in southwestern Ontario because the harsher winters in the more northerly areas usually kill many of the corn flea beetles. In southwestern Ontario, the beetle’s abundance in spring is related to the severity of the preceding winter. 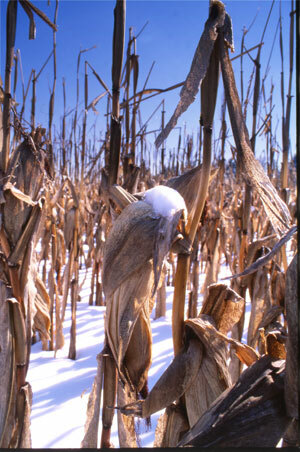 Colder winters kill off more beetles, reducing the risk of early infections in corn. Seed treatments may also help to reduce early infections, says Baute. “A lot of seed treatments now do control corn flea beetle, with the exception that the beetle still has to take a bite out of the plant and could transmit the bacterium.” Baute says that the beetles do not have natural predators that specialize on them, but wet weather can be detrimental to them in the spring because it benefits fungi that can kill the beetles. OMAFRA has been evaluating several models that predict the risk of corn flea beetle survival over winter. Generally, these models use December to February temperatures, although Baute says that the extent of snow cover can also be a factor by providing the beetles with some insulation from extreme cold. Predictions of high risk in spring should prompt producers to monitor and manage corn flea beetle populations. “By managing the vector, particularly early in the season, you can reduce the potential impact of the flea beetle and limit its feeding so you have less transmission of the bacterium,” says Tenuta. However, he says that genetic resistance is probably the best management tool to reduce the spread of Stewart’s wilt. “We see the effectiveness of genetic resistance in our commercial corn hybrids, where we have good tolerance to Stewart’s wilt. We’re seeing more in the in-breds as well, but we still have in-breds that are very susceptible to the disease.” This means that seed corn producers need to continue to watch out for the disease. 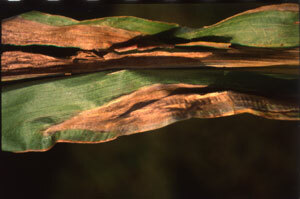 Whereas infection in the young plant can cause it to wilt and die, infection in the mature plant causes leaf lesions, which can contribute to other problems such as stalk rot. In seed corn, mild infections usually remain in the leaf tissue, but severe infections can lead to systemic disease and some infection of the seed. “What we see is that if the plants have more than 75 percent of the leaves infected, some of the seeds may contain the bacterium,” says Zhu. Colder winters tend to kill off more corn flea beetles, thus leading to lower infections of Stewart’s wilt. This is a concern for seed producers because Stewart’s wilt is a quarantine pest for certain countries that import corn seed. The conditions that must be met to export seed to these countries differ depending on the country’s specific import requirements, says Lois McLean, Ontario network plant protection specialist with the Canadian Food Inspection Agency. “Usually for Stewart’s wilt, phytosanitary certification is based on the condition that the seed is grown in an area free from the pathogen, a field inspection during the growing season, or laboratory testing of the seed,” she explains.